Spain is one of the few countries that really boasts an internationally renowned cuisine with historically famous dishes and delicious flavours to excite the tastebuds. The rich gastronomy of Spain is at its finest in the South which makes a holiday in Benalmadena even more appetising and the MAC Puerto Marina Hotel, the exquisite starter to your Costa del Sol adventure. Here at MAC Hotels we have put together a list of the essential dishes and local specialities that you cannot miss out on during your holiday in Benalmadena. Perhaps one of the most important aspects of the Spanish cuisine is the incredible seafood which has led to the fishing industry being an important part of the nation’s economy and tradition. So naturally throughout our recommendations seafood takes a central role, though there is a delicioius abundance of other tasty dishes from which to choose. All you need to do is make room and prepare to find your new favourite food. Fresh prawns are a mainstay in the Malagan diet and this famous dish is a ‘must try’ during your holidays at whatever time of year. Gambas al Pil-Pil is a wonderfully simple dish which involves prawns being flash fried with Garlic, Paprika, fresh chillies and white wine. The cooking method means the natural flavours of the prawns are not overpowered and the delicious sauce can be perfectly mopped up with a slice of crispy bread. With Spain being the world’s second largest producer of almonds and many of these coming from Andalucia is it no surprise that they feature quite heavily in many of the top dishes. Although served all over the country this dish is slightly different in this region thanks to the the sauce which is laced with ground almonds. The delicate flavours are a perfect accompaniment to the Spanish style meatball and give it that southern twist. Not dissimilar to the famous Gazpacho, this cold soup is a tomato based soup that uses bread instead of water to thicken it up. This hearty dish is usually topped with a chopped boiled egg and ham although it can be ordered without for a just as delicious vegetarian option. This delicious smoky flavoured dish comes from the charming town of Antequerana just 50 minutes from Benalmadena and should not be missed. There are few tapas better and more famous than the Fritura Malaguena, which is simply deep fried fish and seafood, usually served with a slice of lemon to bring out the flavours. This dish can be found at any of the best bars and restaurants in Benalmadena and especially in the Puerto Marina area where the you can eat and drink at this picturesque harbour and watch the world go by. If we had to choose the most typical dish from this region then Espeto has to be it! 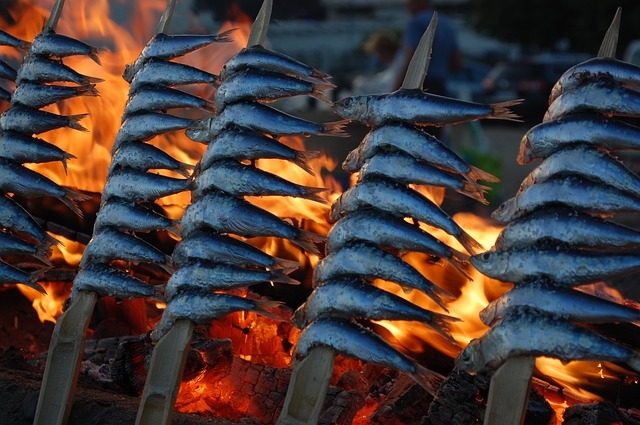 You will struggle to walk along the beautiful coastline without seeing or catching the scent of these delicious barbecued sardines. These freshly caught local delicacies are skewered and roasted over the barbecue, which is often in the form of a boat. So order these by the beach with a cold drink, get your hands dirty and experience Malaga’s finest. There are few better ways to relax than stopping in one of Benalmadena’s squares or pretty streets with a coffee and a slice of the finest Tarta Malaguena. This cake is traditionally made with almonds and the local sweet wine, meaning you won’t need any more than a small slice. It’s the best way to get a sugar hit or an ideal souvenir for those looking to take home a slice of their holiday to Malaga. Also sometimes known as Salpicón, this is a refreshing summer salad that should not be missed. This cold salad is made up of chopped red and green peppers, tomato, onions, olives, tuna and mussels or some other form of seafood and then like most Spanish dishes it’s dressed with a fine olive oil and salt. Though it may sound simple this dish never fails to satisfy those looking for a mediterranean meal on a warm day. Follow our guide to the very best food in Benalmadena and be assured a wonderful culinary experience at our 4-star hotel which also features a high quality restaurant serving international cuisine in our exceptional location.